There are also lot of library which are built upon JQuery as Library,such as Bootstrap and so on. You must need Jquery.js library use just cdn from google. first argument is CSS property ,which we would generally used to animate. step : This function provides an opportunity to modify the Tween object to change the value of the property before it is set. We get the count span counter CSS property starting from zero within a for each loop in jquery and setting the Counter as text by CSS property inside animation function and next comes option which has SWING as transition and then with duration and finally comes step option which is used to once again change the value before set and rounded off with math.ceil function. Demo might load slow.have a look at demo hosted +codepen.ReRun the Code to see the counter changes! See the Pen FatiB by s.shivasurya (@shivasurya) on CodePen. 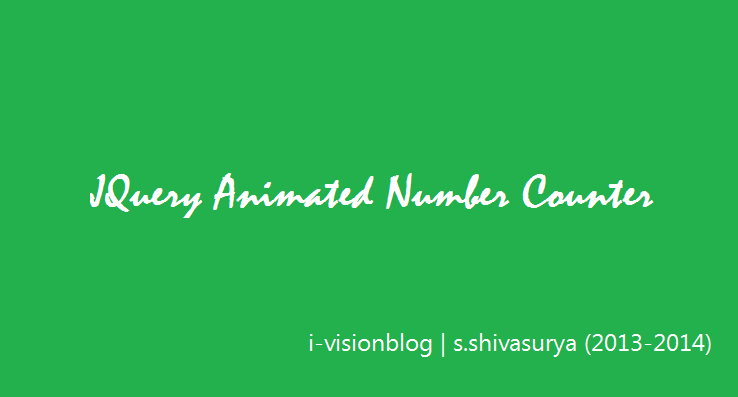 Hope You have Enjoyed this post.Since it was cool one actually showing up in most of the modern websites , which made me to search and compile to perform this animated counter.and a reader too requested via me in Facebook to do with JQuery. For Errors/Comments/Bugs/Hugs mail me s.shivasurya@gmail.com or connect with me in Facebook/Twitter you can raise your exceptions/messages! If I am pulling in the numbers into to count span from the database, versus hard coding the numbers in, the function does not seem to work. It only returns "NaN" for the numbers. Any reason why that is? can u share the code here !